A popular recreational area with views for walkers and joggers prompted council to build a new walkway, car park and shelter to make this popular destination even more accessible, with lighting to cater for the post dusk and predawn users. 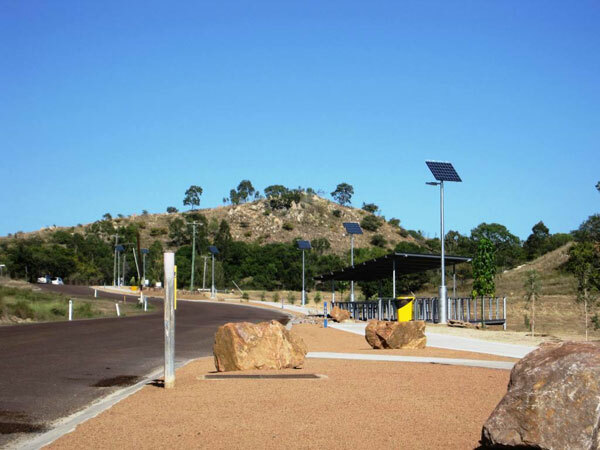 Solar lighting was the preferred option as no reticulated electricity was in proximity to the site and the council saw the value in installing the low maintenance Vertex™ solar lighting systems versus the trenching and cabling and ongoing power costs of mains powered lighting. The pathway consisted of 23 solar lights, providing AS 1158 3.1 P4 lighting at 50 meters between light poles, and the car park consisted of 4 solar lights providing AS 1158 3.1 P11c lighting. The Cree LEDway® 20 light fittings running at 525mA at full illumination for the first 7 hours and the last two hours of the night, and at 70% of full illumination in the between hours. Orca Solar Lighting organised the lighting design and supplied the 25 Vertex™ solar lights within six weeks of receiving the purchase order.